Can Obama Just Run Against Bush Again? 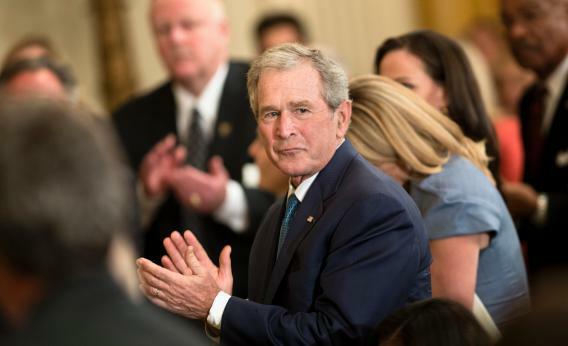 Former President George W. Bush claps during a portrait unveiling ceremony in the East Room of the White House May 31, 2012 in Washington, DC. US President Barack Obama and First Lady Michelle Obama hosted George Bush, the 43rd President of the United States, and his wife Laura Bush to unveil their official White House portrait. New poll numbers from Gallup run against the grain of Dems freaking out about Obama’s “Forward” (or “it’s slowly getting better”) message on the economy, suggesting voters may well be open to it since 68 percent of them still ascribe most of the blame to George W. Bush. Surprisingly, even 49 percent of Republicans, according to Gallup, ascribe the same amount of blame for the tough economy to Bush as Obama. Which basically means that even as the national GOP tries to get the memory of the Bush administration out of the picture – and make this the “Obama economy” – the re-election team will consider dusting off its Bush catalogue and reminding some independent and moderate voters about the last guy in the Oval Office (and how he wants Romney to win). That being said, it’s plausible that excessive attacks on Bush (whose reputation has improved quite a bit since he left office and who has gone out of his way to steer clear of politics) would rub some folks the wrong way. In any case, it bears watching how numbers like these will affect strategy at the Obama headquarters in Chicago.